Ask The Trades - Sliding Upvc Patio Door Seal Trim. Quote: Half the people you know are below average. 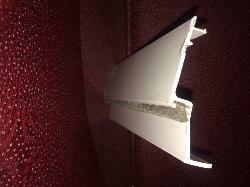 Ask The Trades › DIY Forum › DIY - Carpentry Questions › Sliding Upvc Patio Door Seal Trim. Re: Sliding Upvc Patio Door Seal Trim. "We will fabricate a minimum of 12 feet to your specifications." Sounds good but I think it's going to be too expensive for you. The die might still be a few hundred £ and they might have to buy a minimum quantity of the raw uPVC if they don't have it in stock. Could be other set up charges? They may also only be interested if they think you are likely to order bigger volumes later? Getting exactly the right shade of white may also be an issue? They won't be able to match a sample without a lot of work or luck. If you do give them a call do let us know what they say! Edit: Just noticed they are in the USA ! Thanks very much for that, I'll try what you said. Unless you know the manufacturer and can contact them directly I think you will struggle to find an exact match, but if you google plastic upvc trim suppliers you will find there are lots of firms selling various trims in short lengths, one of which you may be able to adapt to fit. Sliding Upvc Patio Door Seal Trim. I know this is not a carpentry topic but I think you are the best people to help me. Part of the seal carrying trim around my sliding upvc patio door is damaged and I need a couple of meters to replace it. I was just wondering if anybody on here would know where I could buy this profile. (See photo). The overall width is 65mm, flat clip on part is 40mm, 10mm drop with a slot for the seal, 25mmflat and a15mmdrop. Don't know if that's all understandable.